Further updates are not being provided to the DRM-free version previously sold in Humble Indie Bundle 4. All versions require Steam DRM; the DRM-free version is no longer sold. 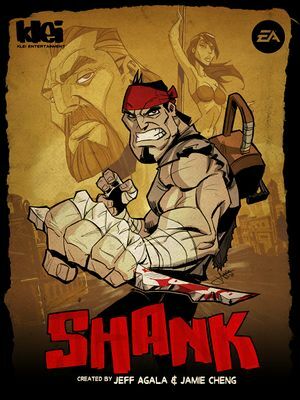 Download Shank - No Intro Fix. Disable intro (or enable intro). Use the -windowed parameter to start in windowed mode. On by default, can be forced off. Frame rate is capped at 60 FPS. With Nvidia FastSync can be capped at 600 fps, but the gameplay starts to work at a very high (non-playable) speed. Start the game in windowed mode by using the -windowed parameter. Press Ctrl+⇧ Shift+← Backspace to toggle Special K's Control Panel. Expand "Window Management" and "Style and Position". Enable "Borderless" and "Fullscreen (Borderless Upscale)". The co-op campaign for this game cannot be played single-player using the game's built-in settings. A work around, however, allows one player to control both characters and thus play the campaign. 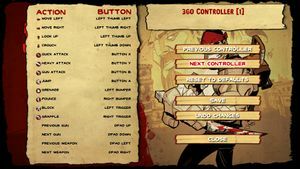 By using a program like JoyToKey, controls for both characters can be mapped to the same buttons. This process is detailed in the Steam Users' Forums. Expand "Input Management" and "Mouse Cursor". Enable "Hide When Not Moved" and adjust "Seconds Before Hiding" as needed. Open <path-to-game>\d3d9.ini or %USERPROFILE%\Documents\My Mods\SpecialK\Profiles\Shank.exe\SpecialK.ini depending on the installation method you used. This page was last edited on 15 April 2019, at 23:58.